On Sunday August 23 Learning2gether met online with Jim Buckingham and Tony Waterman, teachers at Zayed University in UAE and at a defense academy in Muscat, Oman, respectively, to talk about innovation and mindset in teacher professional development and about Jim’s proposal that TESOL Arabia take on board his proposal for an online PD tutorials project. Jim has made contact with ISTE Standards – Senior Project Manager Mindy Frisbee to learn more about how any online programs or resources that we might realize could be awarded an ISTE Seal of Alignment. The idea of pursuing this is driven by a desire to have our work “internationally recognized” so that it has greater credibility in the eyes of both TESOL Arabia members AND those of us who will help realize these. By addressing such standards, we should gain some much valued and highly relevant PD. There is also an Edtech Project (led by Carolyn Sykora) that is currently being supported by various Ministries of Education in the Gulf. The project – better known as ABEGS – is designed to provide sustainable support and training for up to 1.3 million classroom teachers on the effective use of technology and digital resources for learning across the whole of the GCC. Ready or not, here they come! We reveal the key trends, challenges, and developments in technology that are poised to disrupt academic and research libraries worldwide in this free, virtual event. You’re invited to the official release of the NMC Horizon Report > 2015 Library Edition — a collaboration between the NMC, University of Applied Sciences (HTW) Chur, Technische Informationsbibliothek (TIB) Hannover, and ETH-Bibliothek Zurich. Enjoy a front row seat to this “talk show” style event as the co-principal investigators of the project explore the findings from the report. Topics will include improving the user experience of libraries’ offerings, the evolving nature of the scholarly record, and makerspaces — among many others. Library professionals, join us to learn insights to continue advancing applications of technology at your institution. The full list of topics selected by the expert panel for this year’s report can be viewed here. Phil Hubbard joins Vance Stevens to discuss how the team at CPI (Courseware Publishing International in Cupertino California) developed Traci Talk and envisaged its use. 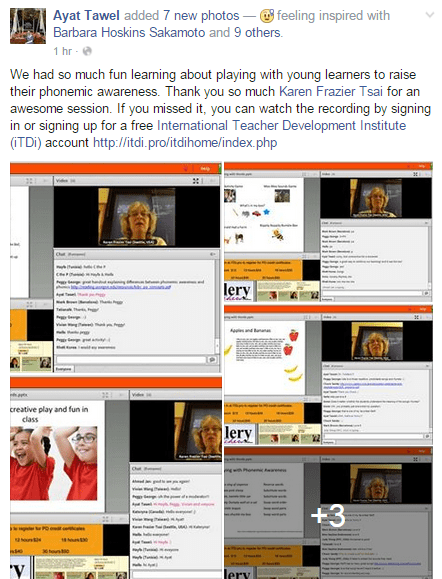 The session was instigated by Sherry Schafer, an ESL professional with research interests in pronunciation and vocabulary teaching, who wrote us for more information after reading about Traci Talk, saying that “It seems like a very innovative program due to the integration of speech recognition technology. Also, the video game aspect of it seems to be very appealing and motivating to L2 users.” She will contribute her insights having used the program with some of her ESL students. More generally we’d like to open up a discussion about whether there’s a place for interactive participatory dramas these days in language learning. Are there apps out there now that do something similar (branching dialogues with voice)? Would it be possible (or better) to have something like this embedded in a virtual world or other environment? Could a chatbot be programmed as a suitable “suspect”? You are involved in a plot … In this program, you are asked to solve a mystery by taking a train to “Cupervale” and posing as a visiting professor at Cupervale University. The person who requested your help has arranged for you to meet one suspect on the train to Cupervale, and for another to pick you up at the station in his cab. You are taken to your apartment where your neighbor is a third suspect, you meet a fourth at a dinner party, and so on. The plot thickens … As you meet each character you have the opportunity for an extended conversation that can take many paths. You are able to talk to the characters using a microphone attached to the computer. In so doing, you are exposed to a large amount of natural and communicative English, which you hear, but can also see in text form if you wish. Many of your utterances are recycled in the program to reinforce learning. Learn English while solving the mystery … At the beginning of the program, there is a basic training session where you can practice. 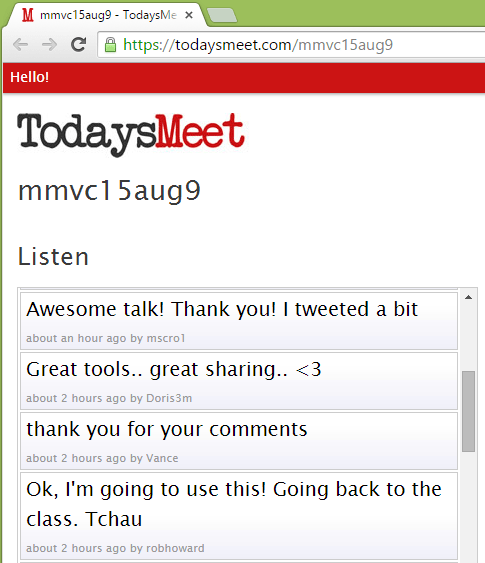 Or, you can start conversing with the characters directly. Repeating the conversations allows you to obtain additional information by following the many different paths. When you feel you know each of the characters you can go to the next level by answering a series of 8 questions correctly (taken randomly from a pool of 60). If you pass this test, you can invite the suspects to your place for a chat and try to solve the mystery!! 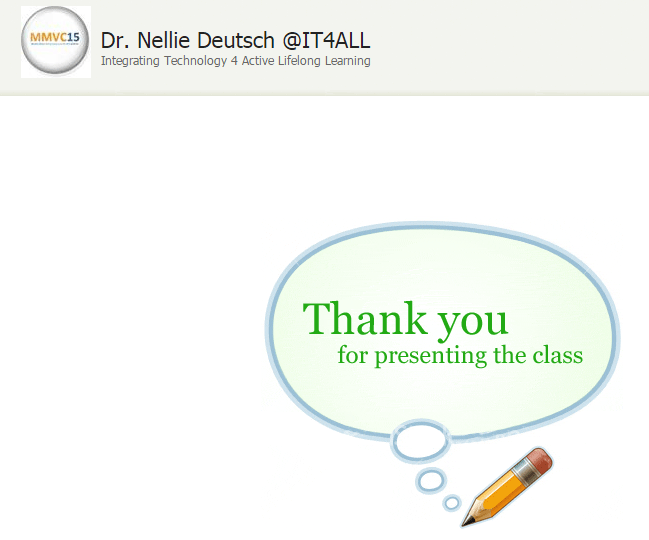 Welcome to Creating Engaging Online Learning Activities! We’ve had a big hiatus from SCoPE seminars, and it’s so exciting to be opening up the conversations again! 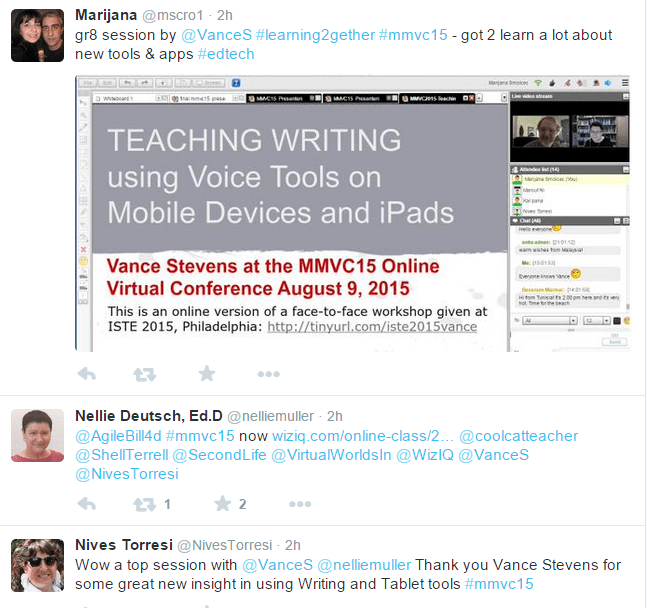 There are endless ideas for engaging learners online. However, turning those ideas into activities that can be implemented smoothly is a challenge. There are many details to consider, and potentially overlook! The idea for this SCoPE seminar developed through reflections on a series of online workshops for educators across the British Columbia post-secondary system. In these workshops we experience the benefits of developing and testing online learning activities in a supportive but critical community of peers. It’s time to open up those opportunities to everyone! 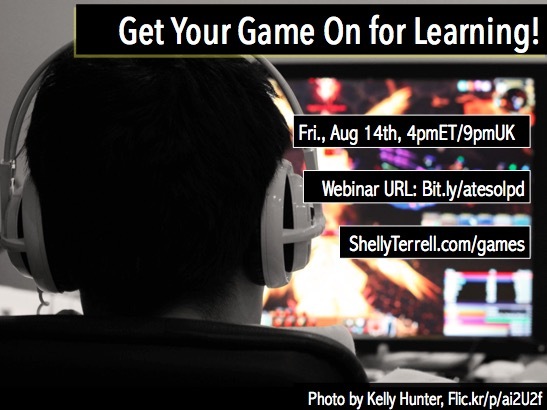 During this 2-week seminar we will explore, discuss, and create engaging online learning activities together. There are two webinars scheduled as part of this 2-week seminar discussion. They will take place in the SCoPE Blackboard Collaborate Room: http://urls.bccampus.ca/scopeevents. As always, the synchronous sessions will be recorded for those who are unable to attend. This presentation updates earlier ones on how to use the voice affordances of iPads and other mobile devices to make writing as well as teaching writing and giving feedback increasingly easier and more effective when students are using such devices than when voice tools are not appropriately enlisted. 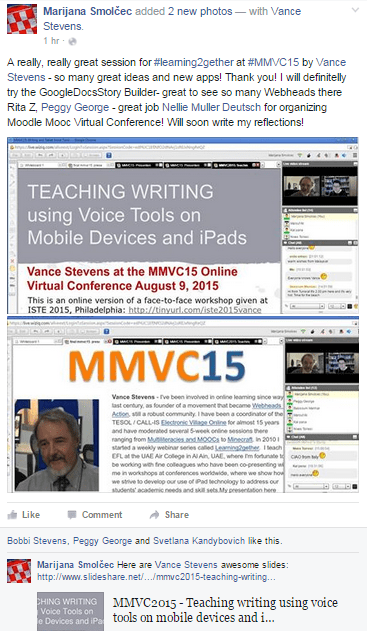 The presenter learns more every day about how to use these tools in teaching, and here he conveys what he has learned in hopes it will help other teachers of writing whose students are challenged when trying to write effectively on mobile devices. Rated a ‘double-really’ from Marijana 🙂 glad you liked it! Anita Adnan Using FB closed group to support postgraduate students in their journey : an initiative by DSG team, Malaysia. Dr. Nellie Deutsch Where’s my Badge? I did all my work? Join Amy and Wes as they interview Vanessa Perez, an amazing, energetic, inspirational and always-sharing teacher at Tomlinson Middle School in Lawton, Oklahoma. Vanessa will share some of the STEAM lessons she’s done with students in the past as well as lessons she’s planning for the upcoming school year. She’ll also discuss her strategies for success writing small grants for classroom supplies and furniture, as well as share about her innovative classroom space designs. Vanessa recently started a #notreadytour Challenge for teachers on http://discover.oklaed.us and will talk about the goals for the project as well as how it’s going. Please join us for an hour of great Saturday professional development on August 1st! Week 1: Exploring Options, Selecting Approaches Week 2: Building and Testing OLAsThere are two webinars scheduled as part of this 2-week seminar discussion. They will take place in the SCoPE Blackboard Collaborate Room: http://urls.bccampus.ca/scopeevents. As always, the synchronous sessions will be recorded for those who are unable to attend. 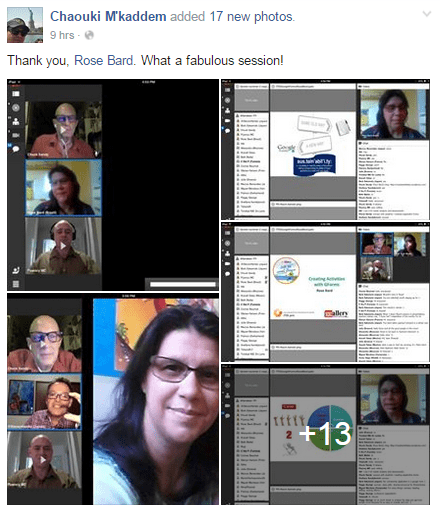 Thanks to Carlos, Gina, and SylviaC for participating and sharing their questions and ideas during today’s session. If you weren’t able to make it, you can watch the recording (including the occasional glitches). If you have any questions, just post in this thread. with a ten-day event featuring up to three presentations a day. 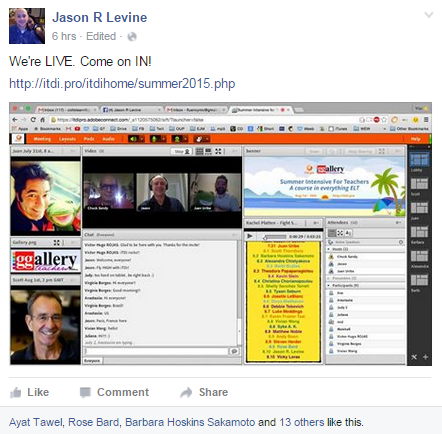 This one was called Summer Intensive for Teachers and it started July 31, 2015 with the following event. These events were free and they were archived, but in order to view archives, you must first sign up for a free iTDi account at http://iTDi.pro and agree to receive the iTDi Newsletter each month by email. Registration then grants you access to the archived recordings. The record that appears here is to document what Learning2gether was up to at this time and for the convenience of participants in L2g in accessing the event after the fact. Please keep in mind that registration with iTDi is required to view the recordings and that the definitive archive is as noted above. Juan Uribe is a teacher trainer whose passion is studying & sharing how children learn languages affectively through play, games, storytelling, & puppeteering. He has been in an amazing journey visiting language schools for children around the world where he has both conducted teacher development programs as well as enchanted young audiences with Buddy the Frog. He writes a well-known blog called Children Learning English Affectively. Being Affective Is Truly Effective! Come learn how affective learning can engage and empower your students’ learning and your teaching. During this presentation we will explore how practical affective pedagogical practices can create nurturing mental models about student’s own learning, language uses, and their own linguistic competence. Join me in a journey with lots of play, imagination, and curiosity. Destination: language learning ownership. 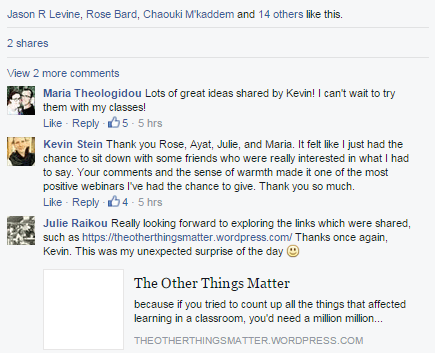 Juan’s blog post on this event is called My first webinar on Affective Language Learning! Scott Thornburyis a teacher and teacher educator, with over 30 years’ experience in English language teaching, and an MA from the University of Reading. 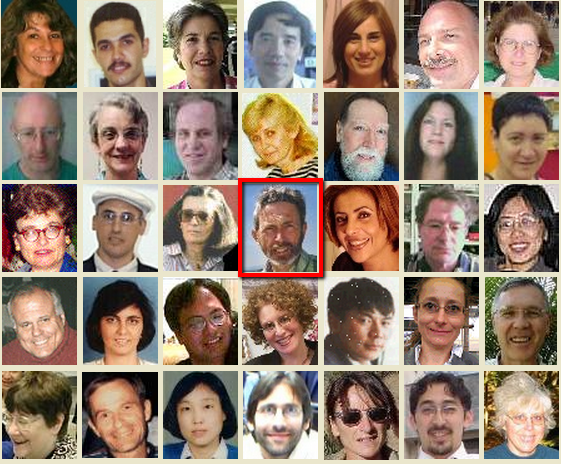 He is currently Curriculum Coordinator of the MA TESOL program at The New School in New York. His previous experience includes teaching and teacher training in Egypt, UK, Spain (where he lives), and in his native New Zealand. His writing credits include several award-winning books for teachers on language and methodology, as well as authoring a number of papers and book chapters on language and language teaching. 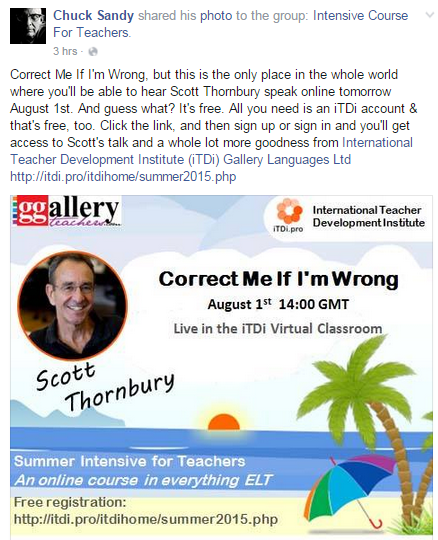 Scott is series editor for theCambridge Handbooks for Teachers (CUP), co-founder of the dogme ELT group and an associate of the International Teacher Development Institute (iTDi). Finally, here’s a link to Scott’s Amazon site. Based on the speaker’s own recent experience of ‘de-fossilizing’ his Spanish, a case is made for the key role that correction (including explicit negative feedback) plays in boosting student achievement and enhancing teacher effectiveness. In our well-intentioned efforts to promote authentic communication in the classroom we sometimes overlook the one component of classroom interaction that distinguishes it from other forms of interaction, and which makes it especially effective: i.e. corrective feedback. In this class we will look at different options for the form, frequency and timing of corrective feedback, with special reference to oral production, and discuss how these might impact on learning. 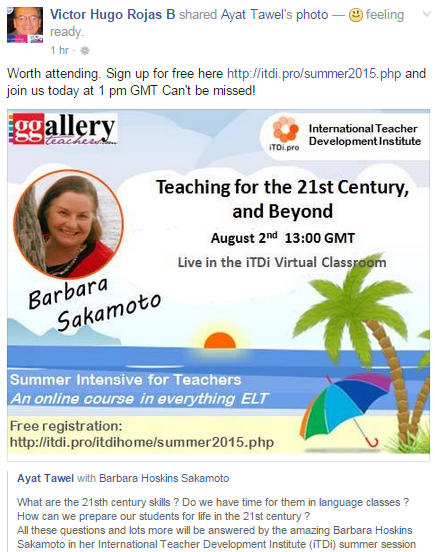 Barbara Hoskins Sakamoto is a Director of the International Teacher Development Institute and co-author of the iTDi’s online course, English for Teachers. Barbara is also co-author of one of the world’s best-selling English courses for children, Let’s Go (OUP). She has taught ESL in the US and EFL in Japan, and has conducted teacher training workshops around the world. She blogs at Teaching Village and Teaching Children English. What are 21st century skills, really? And, do they have any place in language class, where time is limited and the focus is on learning English? Fifteen years into the new century, researchers have had time to look at innovative teaching practices around the globe to identify those approaches make the greatest impact in preparing our students for life in the 21st century, and beyond. In this session we’ll look at teaching techniques that will help your learners become strong English users and also critical and creative thinkers. By making every moment of class time count, you can help your students succeed – whatever their future holds. Alexandra Chistyakova is an English teacher at the Physics faculty of Moscow State University, Russia. She also works as a freelance teacher giving one-to-one English lessons to the large range of learners: from preschoolers to senior adults. She’s always been engaged in the continuing professional development, taking teacher-training courses, studying specialized literature and taking part in ELT conferences and seminars. She received her CELTA at BKC-in, Moscow, in 2011. Her professional interests include: professional development, ELT methodology, teaching 1-2-1, and language course design. All aboard! Our hot air balloon is departing soon! We are going to take a nice ride across the vast world of ELT methods, looking at the most prominent and the most interesting ones from the height of our experience and knowledge. As we go from one method to another we will consider the benefits each approach can give and will pick up some practical ideas of how to make the most of the existing ELT methods in our classrooms. Barbi Bujtas is a freelance EFL instructor in Hungary. She has been teaching for 15 years in various teaching environments from one-to-one to high school, depending on local demands. Her professional interests are dogme, ICT, engagement, materials design, teachers’ communities. Fake it till you Make it Do you know this huge gap between what your students want to say and what they can say in English? Nowadays technology allows you to create cool videos in which your students actually speak a level of English far beyond their actual stage in their interlanguage. They are based on their ideas and choices, which means an ownership of their learning, it also means a higher level of motivation and more effort than usual. The end product shows them a possible future self that can say what they want in English. This session shows you some examples and ideas of how to use ‘fake it till you make it’ video projects with young learners. Theodora Papapanagiotouis a teacher of EFL and DaF in Greece since 1992. She has worked at various language schools in Thessaloniki with various levels and ages. In the past few years she has been taking part in conventions, webinars and online courses, trying to become a better teacher. Currently working as an educational consultant at Hyphen SA. 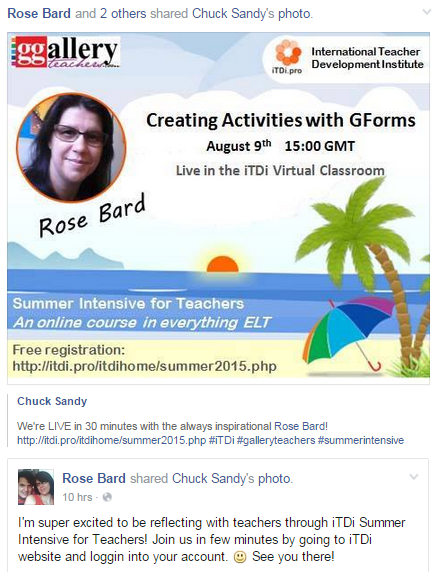 She isthe author of Keep on Teaching and alsoblogs for iTDi. Find her on Twitter:@DoraPap72. Be Different! Are you bored with the traditional foreign language lesson? Tired of performing your lessons based on a course book? Have you ever thought of integrating your students’ personalities and interests in your teaching? In this presentation I am going to show you how my last year has been, trying out revolutionary methods in my classrooms, using the differentiated instruction approach and blended learning. 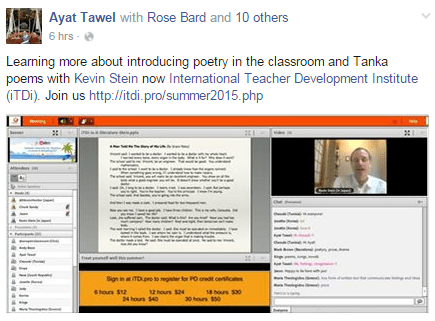 1 pm Kevin Stein is a high school teacher, curator of the iTDi blog, and singer of silly songs. He also believes in the power of students to find their own path forward and the importance of relationships in building a community of learners, whether it be students, teachers, or a mixture of the two. But That’s Not Literature, is it? There is all kinds of literature out there in the world and much of it is just waiting to be used in a language classroom. In this lesson we will take a look at some short poetry and stories and explore why students might have difficulty engaging with and understanding ‘literature.’ Participants will walk away with some concrete techniques for helping students engage with a text and ideas for how to use literature as a jumping off point for classroom activities and conversations which can engage our learners on a deeper, more intellectually challenging level. 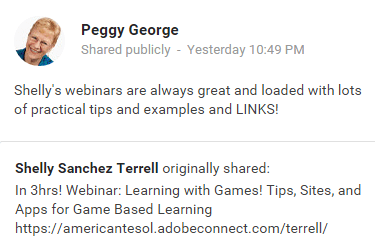 Shelly Sanchez Terrell is a teacher trainer, elearning specialist, and the author of The 30 Goals Challenge for Teachers and Learning to Go. She has trained teachers and taught language learners in over 20 countries as an invited guest expert by organizations, like UNESCO Bangkok, the British Council in Tel Aviv, IATEFL Slovenia, HUPE Croatia, and VenTESOL. She has been recognized by the ELTon Awards, The New York Times,NPR, and Microsoft’s Heroes for Education as a leader in the movement of teacher driven professional development as the founder and organizer of various online conferences, Twitter chats, and webinars. Recently, she was named Woman of the Year 2014 by the National Association of Professional Women and awarded a Bammy Award as a founder of #Edchat. Teaching the Emoji Generation Our learners are fluent in different languages, especially emoji! They translate, decode, read and write in emoji throughout the day. 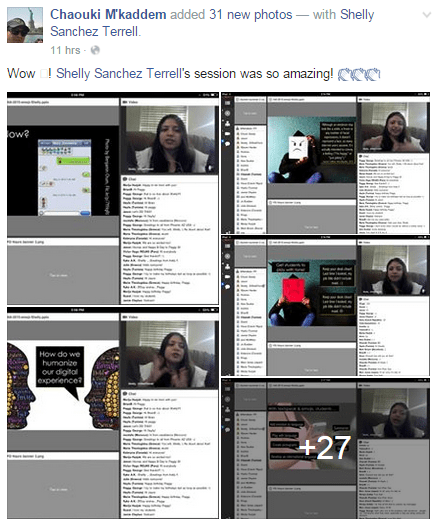 Join Shelly Sanchez Terrell for an active session learning emoji. We will also learn ways to get students motivated to learn English and improve their fluency by integrating text speak and emoji activities into our curriculum. We will also participate in icebreakers to help us effectively teach digital literacy and citizenship. As an EAP teacher in higher education, Tyson focuses on meaningfully engaging students with their L2 reading to afford stronger application of academic writing skills. This led to authoring Academic Reading Circles(the round). As a teacher within the ELT community, he is driven to create new public spaces for and aid self-directed action among language teachers to increase agency in their own development paths. These have led him to his MA in Educational Technology & TESOL, writing at 4CinELT, and organizing #tleap. Beyond the Comprehension Question: Digging Deeper into Texts While the comprehension question prevails in reading-focussed lessons as one tool for validating understanding of text concepts, supplementing it with learner-centred, co-constructive activities can engage students further and improve their comprehension. In this talk, we will explore ways in which we can complement this tool, by equipping learners with methods that encourage deeper questioning of a text and more collaborative interactivity with it. Activities from the book, Academic Reading Circles (the round), will be used and built upon so that participants will leave with enough ideas to adapt them to their teaching contexts. Josette LeBlanc has been working with English language teachers in Korea since 2010. During this time, she developed an interest in reflective practice for professional development and writes about it on her blogThrowing Back Tokens. This experience also motivated her to research the topic of teacher well-being as many spoke of feeling unhappy and burnt-out. As a result, she now curates a website,www.redthumbforlove.wordpress.com, where teachers from around the world share their stories and strategies for self-care and self-compassion. You can find her on Twitter at@JosetteLB or on Facebook at,KMU-SIT Professional TESOL Certificate. Play Big: Start Small You may have heard ofS.M.A.R.T. action plans when it comes to creating lesson objectives or teaching goals. Although “smart” in theory, these action plans may leave teachers feeling dissatisfied to the point of inaction. One way to change this is to turn S.M.A.R.T. into a S.M.I.L.E. Based on research in neuropsychology and personal development, S.M.I.L.E. is an approach to action planning that can relieve the weight of overwhelm or perfectionism, and enhances our sense of satisfaction. During the session, we will examine this approach in order to develop the type of teaching practice we desire. To access recordings, sign up for a free iTDi account at http://iTDi.pro and agree to receive the iTDi Newsletter each month by email. Divya Madhavanis a Senior Lecturer in Language and Education at Centrale-Supélec, Université Paris-Saclay. She teaches English language courses, and lectures on Education and Society. Her areas of research include, Critical Pedagogy, Assessment and English as a Medium of Instruction. 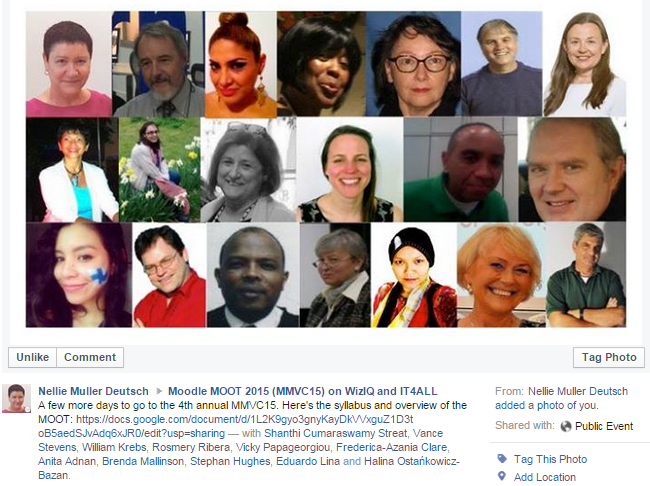 She is the current Website Editor for the IATEFL Teacher Development SIG and an iTDi Mentor. Divya has just completed an MEd in Education Research, and has an MA in Language Education. She is also a Fellow of the Royal Society of Arts. Action Research and Your Teacher Voice This session is a step-by-step description of what an action research project looks like, from broad questions like “why do it?” to specific questions like “how can I write up data?”. This will be your chance to talk to me and other people interested in action research, and think about why you might want to become an action researcher. Debbie Tebovich is a freelance English Language Trainer and iTDI mentor based in Buenos Aires, Argentina. She has been teaching English for over 20 years and teaches General English and Business English on a 1-1 basis online and offline.She is passionate about teaching and learning and she is a technology enthusiast to create memorable learning moments. Above all, she strongly believes in the power of Education to transform people’s lives, to help and encourage freedom of thought and to develop bonds to make our world a better place for all of us and for future generations. How can we predict goals and outcomes when we ditch lesson plans? How can this free us up and allow learners to lead the journey? As connected educators, we will explore these questions from a Rhizomatic Learning perspective. I will share an example of a real Business class which emerged as we started searching for answers to my learner’s feelings and questions. 1 pm Luke Meddings is an award-winning author, international speaker and teacher trainer. In 2000 he co-founded Dogme in ELT with Scott Thornbury, and their book Teaching Unplugged (Delta, 2009)won a British Council ELTon award in 2010. He co-founded e-publishing collective The Round with Lindsay Clandfield in 2011, and their book 52: A year of subversive activity for the ELT classroom, was published in 2012. 2015 will see plenaries in Mexico, Greece, Ireland and Malta. Punctuation Marks?! Exploring Learner Stories and Teacher Interventions in the Unplugged Classroom… Teaching unplugged means responding to information, eliciting contributions and offering on the spot language help and advice. This session uses punctuation marks as an analogy for different kinds of teacher intervention – both during conversation, and when conversation is paused for language development. Punctuation may not carry the content of a text, but it helps to make sense of it – and these little marks are an essential part of the story. Play is a fundamental way that young children learn. Child’s play is also a valuable tool that can be utilized to help students learn the rudimentary skills they need to begin reading. Blocks, rebus words, word cards, flannel posters and more can be used to create an understanding of the English sound/spelling patterns and simple word families.Learn about some hands-on activities, which creatively engage young learners and are designed to build phonemic awareness, knowledge of phonics and beginning reading skills. Vivian Wang M.A. English and American Literature, B.A. English Language, Linguistics and Literature, is an experienced teacher with thirteen years of teaching experience. She has taught practically every age group, from toddlers to adults, and has worked for private language schools, high school and educational corporation. She is a certified trainer of Oxford Teacher’s Academy. 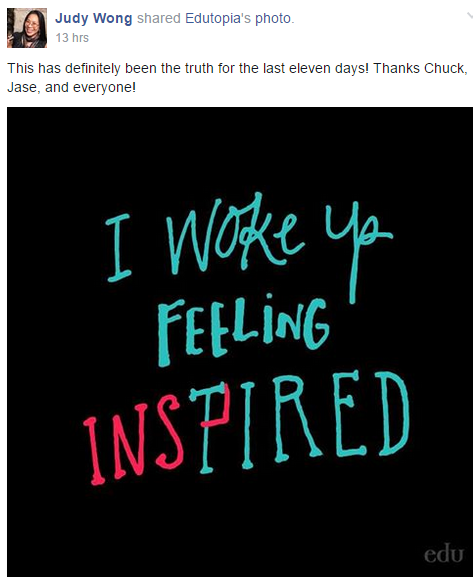 She has also been a university instructor for seven years. Vivian is particularly interested in skills of motivating students in learning English. She currently teaches in Shih Hsin University, works as ELT Trainer (Taiwan) for Oxford University Press, and continues to enjoy sharing ideas with teachers. We live in an age of rapid change. Students in the 21stcentury need to do more than acquire information. The way we teach needs to take into account the students that are in front of us, the skills they have, what interests and motivates them and, perhaps most importantly, what we can and should offer them. This session is for teachers who believe that learning and creativity go hand in hand; and for teachers who want to spice up their curriculum, break the mold and meet the needs of 21stcentury students. SYKE A.K. holds a Bachelors of Education as well as a Masters in English, and has been teaching English for the past 13 years in high schools and universities in his home state in India. 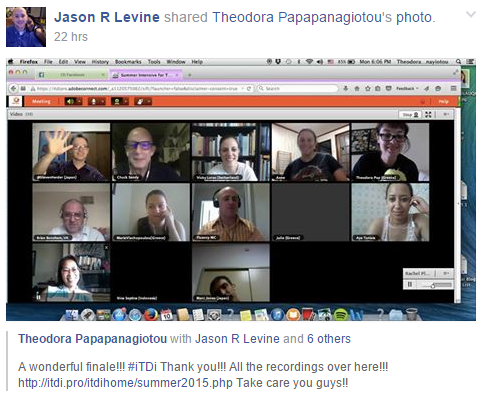 He is an iTDi Mentor, presenter, materials writer and a coordinator/host of webinars and virtual conferences. Syke has presented papers at many national and international conferences.He spoke at the Associates’ Day of IATEFL Manchester 2015 , representing the ELTAI. Teaching English Through Poetry of Other Languages Poetry is definitely the soul of a language ….an embodiment of its cultural identity.. Have you ever thought of using poems in other languages in your English class room ? Here, I would like to show you , how the poems in L1 or L3 can be used effectively in an ESL classroom. Matthew Noble is a teacher and teacher trainer from Boston, MA who joined the ELT field as a volunteer in Sri Lanka in 2004. 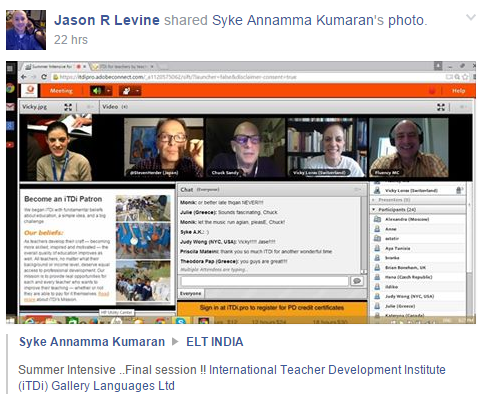 Since then he has taught children and adults abroad and in the US, helped train new and experienced teachers F2F and online, and discovered the wonderful world of web-based professional development at iTDi and elsewhere. He’s thrilled to be a part of this amazing event for a 2nd time and looking forward to learning and sharing along with teachers all over the planet this summer! Tweet him here. Andy Boon is an associate professor at Toyo Gakuen University, Japan. He has been teaching for over 17 years and is near completion of a PhD. He has presented at many conferences, and has published articles on teacher development, motivation, ER, and methodology. He is the co-author of textbooks – Discover the News (Language Solutions, 2013), Inspire (National Geographic Learning), author of Research & Write (Macmillan), and author of various graded readers (Macmillan and Atama-ii). Setting up an Extensive Reading Program: The Beginning, the Middle, and the End This session will provide an outline of how to set up an extensive reading (ER) course or program at your school. It will describe how you can orient students to ER, how you can finance ER, what students can do in the ER classroom, how you can assess ER, and how ER can help to improve your students’ English. 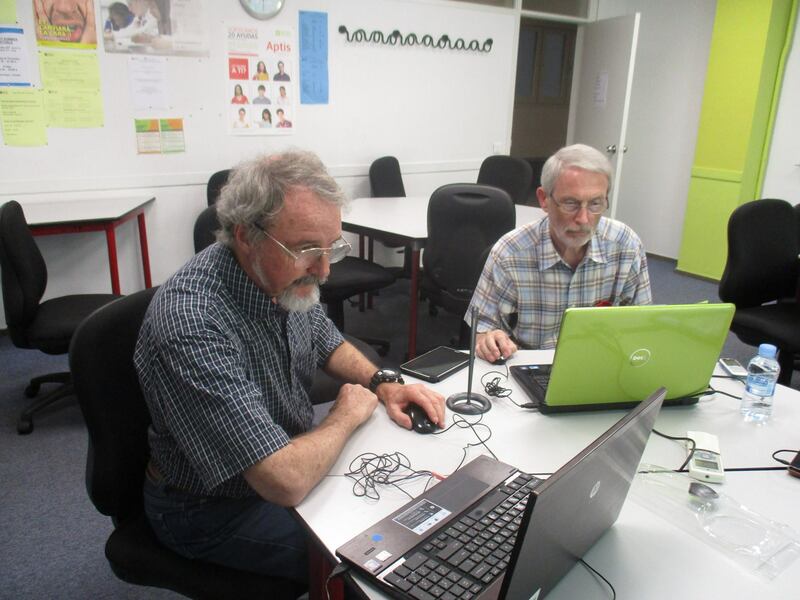 Steven Herder has been teaching within the Japanese EFL context for over 25 years. Having many years teaching experience at the elementary and junior/senior high school level, he is currently an assistant professor in the Department of International Studies at Doshisha Women’s College of Liberal Arts, teaching TOEFL iBT preparation, and a 3rd/4th year seminar on Exploring Leadership.He is an author and editor of two Palgrave Macmillan teacher resources, Innovating EFL Teaching in Asia (2012) and Exploring EFL Fluency in Asia (2014). In 2012, he and a network of like-minded educators co-founded the International Teacher Development Institute (http://itdi.pro), an online community for teachers by teachers, with over 5000 members and a global reach into over 100 countries. Online Tools that Spur Improvements in TOEFL iBT Essay Writing Japanese students planning to study abroad at a foreign university for a year need to score significant points in the TOEFL iBT or IELTS exam. Over the past 5 years, I have helped hundreds of students improve (to varying degrees) their essay writing for such a standardized test. In this session, I will share approaches and techniques that have been the most successful to date. These include collaboration, fluency, reflection, data analysis, cohesion, coherence, and error correction. has been an English teacher in Brazil for more than 17 years. She’s an iTDi MENTOR/BLOGGER and the CO-Moderator of BRELT FB community. 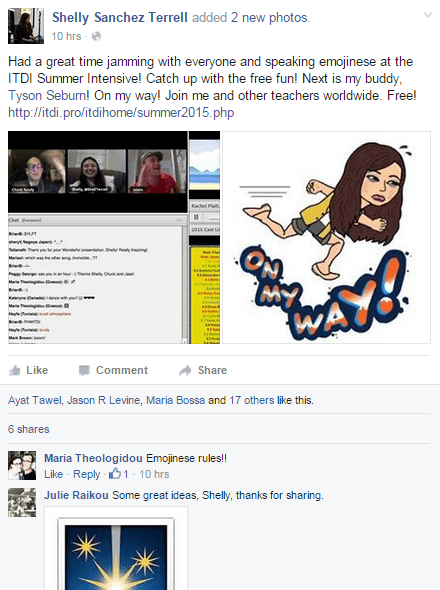 She’s been actively learning and sharing online through her blog ELT Diary and PD opportunities since 2012, and also with and from iTDi community. Have you ever used Google Forms? Have you ever thought of using them to expand the contact hours with English which learners need to continue improving their reading and listening skills as well as their language knowledge? GForm is a free online tool that can be easily embedded in other free online spaces (Wiki, Blog, Google Site, etc.) . In this session, let’s look at the possibilities of using GForm to engage, support, test and collect feedback in order to make homework more interesting to learners and personalize learning. 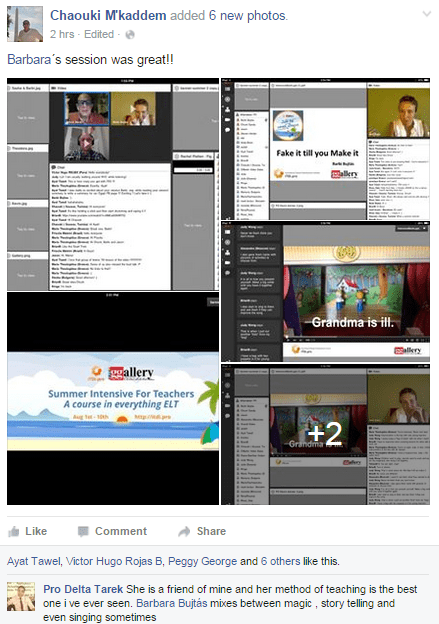 is Ambassador and Knowledge Entertainer at Gallery Languages, where he conducts webinars and workshops for English students and teachers at schools worldwide. He is the creator ofColloLearn, an approach to English language learning based on the songs he writes and performs as Fluency MC. He also writes songs and chants for several publishers, including Oxford University Press. As an English Specialist with the U.S. Department of State, Jason has led teacher training programs in fourteen countries in Europe, the Americas, Africa, and the Middle East. Practicing English, like practicing a sport or a musical instrument, leads to accurate and fluent performance. Yet most English learners do not get the practice they need to use English with confidence in or out of the classroom. As a result, they lose motivation. In this talk we will discuss what we can do as teachers to help students get the language practice they need to achieve their communicative goals. Vicky Loras is an English teacher,born in the beautiful city of Toronto, Canada. She has been teaching English as a foreign language and literature to students of all ages, since 1997. She now lives in Switzerland and she is the co-founder and owner ofThe Loras English Network, a school she has opened with her sister Eugenia. They teach English, train teachers and also hold children’s events. Not Only Staying Afloat, But Also Making Waves There are a lot of teachers around the world, more than ever, who have to face a lot of difficulties when teaching – budget cuts, restrictions, little or no support from their administrators. Do they give up? No – and they do much more! We will look at this wonder of educators and what they do. Chris Fry is a long-time Webhead in Action, part of the original group in 2002. We had never met f2f but he still lives in Barcelona where he and Vance met to discuss with his work with students Story Recording, a project Chris has been working on over the last few years, and posting about it on his blog here: http://onewaytotefl.blogspot.com.es/ . He is planning to present on this topic at an ELT conference at the British Council in Barcelona at the end of September and again to colleagues at the start of October. This unique Learning2gether session previews these later talks and was webcast live from the British Council, Barcelona Amigó Centre. Chris’s students recorded themselves in class every day for this course, usually re-telling a story. Some of them also recorded themselves out of class (see for example http://onewaytotefl.blogspot.com.es/2014/07/how-best-can-technology-help-students.html). Here are some sample recordings; i.e. His star student in a pre-intermediate course, who recorded herself about 270 times over 30 weeks! Another who has done two consecutive courses with him and has made 430 recordings over about 50 weeks! In this presentation, he compares his research this year with findings from the year before in an attempt to measure the effects of the small changes made based on his analysis of his first year results. which he’ll be putting on his blog http://onewaytotefl.blogspot.com.es/ and on his teachers’ portfolio at work. To list all available commands enter “/?”. Chris Fry joined group chat. Vance Stevens joined group chat. Rita Zeinstejer joined group chat. Robert Wachman joined group chat. Sabrina Wilson joined group chat. Robert Wachman left group chat. Hi I’m here & have my mic switched off. Looks like you’re in a classroom, Vance. Is that Bobbi moving around with the tablet? Benjamin L. Stewart joined group chat. Maria Colussa joined group chat. zl wang joined group chat. 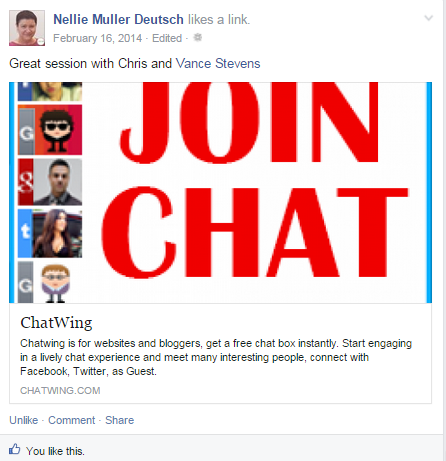 Nellie Deutsch joined group chat. zl wang left group chat. Benjamin L. Stewart left group chat. which tools did you use to do the recording, Chris? How would you encourage students to listen to themselves? Have you considered using badges? What about peer review? Was it mentioned? how do you integrate it, Nellie? I try to involve students in peer evaluation. I can also help, Rita. Contact me and I will walk you through it. thank you so much, Nellie! is it also a kind of hosting place for recordings? I thought Edmodo was more for kids than adults. Is that true? I minute is long for many students. Does pointing students to mistakes, help them improve? “Are you listening me?” is a mistake that I find hard to change in Spanish speakers. Journal writing helps because you never criticize. Yes, some people are stingy with compliments. Learning a foreign language helps teachers understand language learners. Hey, Rita, are you going to FAAPI? oh, ok enjoy your trip then and I hope to see you again soon! you going to happy, Maria? Maria Colussa left group chat. Vance Stevens left group chat. Rita Zeinstejer left group chat. Sabrina Wilson left group chat. I have to excuse myself for a late dinner. It’s 8:43 p.m. here. Just realized, I should exit the HOA to make room for more people. So I’ll do that. But this would have added so much more to the learning experience. Great idea Chris. Robert I think you can join again. Are you watching from a passive link? Zi, enter where? the hangout? Yes, I agree with you Maria. I’ve been trying to keep them in a googledrive file but want something for the sts to record and keep themselves. As a backup to what I keep. How do you encourage students to listen to themselves or each other? Does hangout not provide a chat for those who are not directly in the hangout? Question – Are there any issues with protecting student privacy.. Do students ever have reservations about posting their recording to the general “public”? Perhaps you use this as a motivator to get them involved … authentic recordings. Good question James…private setting would be good. I’ll have a look later. Do the students have control over the recordings? Can they delete them afterwards? James, can you add your comment in the google hangout chat? can you com here nellie? OK I’ll have a look later. At the moment I’m using google drive to store 15 minute conversations which both student & myself have access to. I bring it up because it can be an issue. A student not wanting it to be “public” because of concerns that someone could be judging them on the quality of their learning or development. yes, students are very self conscious about their performances, one of them told me: You can burn it now! Sorry I didn’t get here earlier… and my apologies if I ended up bringing up issues that you may have already addressed . Yes, we share a lot of stories about our lives & don’t want these public. Just think that “public” vs “private” becomes a wonderful authentic teaching / learning moment .. and authentic “discussion” point for students to be motivated to talk to. You’ll need to get a PHD student to get involved. Just curious.. how would a student know how to prepare and “succeed” in such “speaking exercises”? How to motivate them to attempt.. ? .. so should the focus be more on communicating an idea.. rather than on exact pronunciation? The pronunciation is rated according to how much it supports the communication of an idea. Like what Rita is saying. Great presentation Chris – thank you. Best wishes gentlemen.. Many thanks for sharing.. Thanks to you too Sabrina..
That was funny I was stuck & couldn’t leave. Enjoy Barcelona & see you guys online soon. James. That’s what my summer project is about.. recorded conversations via skype but my mini mountain is to create some sort of tasks for sts to listen to the recordings and learn how to evaluate their progress. Not sure where to start but have the summer off work to get this going. 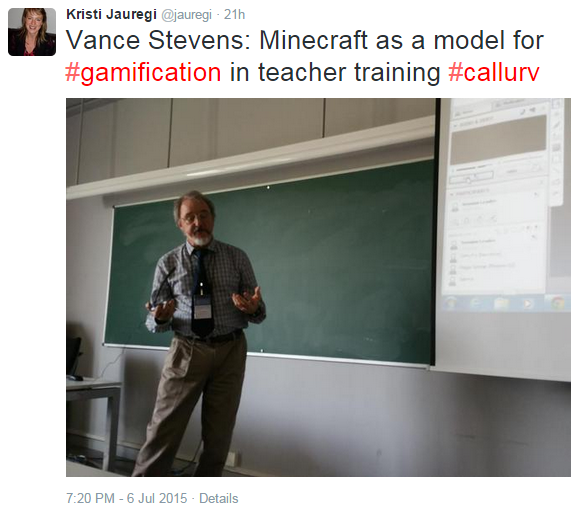 In a nutshell, the presentation is about the gamification of professional development, how learning the game of Minecraft (ultimately while trying to stay alive in Minecraft) can inform educators on how professional development can be structured in a more meaningful sense than that which many of us often encounter. The problem is that the experience is ineffable, which makes it difficult to explain to others who might be amenable to such an approach or who might be appealed to to provide resources to support it. Such drawbacks are overcome in EVO sessions where the small number of participants who choose to join us are predisposed to this kind of learning. However, if I were to suggest to my colleagues at work that we hold future meetings, or even just one meeting, in Minecraft … well the suggestion of meeting in any kind of virtual space goes against the grain of those who like to hear themselves talk in meetings (on the other hand, we used to have great success with departmental retreats at the U of Hawaii, which all were required to attend, leading to similar outcomes but in a more tangible environment).